arXiv (pronounced "archive"—the X represents the Greek letter chi [χ]) is a repository of electronic preprints (known as e-prints) approved for posting after moderation, but not full peer review. It consists of scientific papers in the fields of mathematics, physics, astronomy, electrical engineering, computer science, quantitative biology, statistics, mathematical finance and economics, which can be accessed online. In many fields of mathematics and physics, almost all scientific papers are self-archived on the arXiv repository. Begun on August 14, 1991, arXiv.org passed the half-million-article milestone on October 3, 2008, and had hit a million by the end of 2014. By October 2016 the submission rate had grown to more than 10,000 per month. arXiv was made possible by the compact TeX file format, which allowed scientific papers to be easily transmitted over the Internet and rendered client-side. Around 1990, Joanne Cohn began emailing physics preprints to colleagues as TeX files, but the number of papers being sent soon filled mailboxes to capacity. Paul Ginsparg recognized the need for central storage, and in August 1991 he created a central repository mailbox stored at the Los Alamos National Laboratory which could be accessed from any computer. Additional modes of access were soon added: FTP in 1991, Gopher in 1992, and the World Wide Web in 1993. The term e-print was quickly adopted to describe the articles. Although arXiv is not peer reviewed, a collection of moderators for each area review the submissions; they may recategorize any that are deemed off-topic, or reject submissions that are not scientific papers, or sometimes for undisclosed reasons. The lists of moderators for many sections of arXiv are publicly available, but moderators for most of the physics sections remain unlisted. The standard access route is through the arXiv.org website or one of several mirrors. Several other interfaces and access routes have also been created by other un-associated organisations. These include the University of California, Davis's front, a web portal that offers additional search functions and a more self-explanatory interface for arXiv.org, and is referred to by some mathematicians as (the) Front. 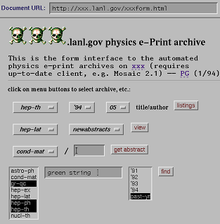 A similar function used to be offered by eprintweb.org, launched in September 2006 by the Institute of Physics, and was switched off on June 30, 2014. Carnegie Mellon provides TablearXiv, a search engine for tables extracted from arXiv publications. Google Scholar and Microsoft Academic can also be used to search for items in arXiv. A full text and author search engine for arXiv is provided by Scientillion. Finally, researchers can select sub-fields and receive daily e-mailings or RSS feeds of all submissions in them. While arXiv does contain some dubious e-prints, such as those claiming to refute famous theorems or proving famous conjectures such as Fermat's Last Theorem using only high-school mathematics, they are "surprisingly rare". [better source needed] arXiv generally re-classifies these works, e.g. in "General mathematics", rather than deleting them; however, some authors have voiced concern over the lack of transparency in the arXiv screening process. ^ "Arxiv.org Traffic, Demographics and Competitors - Alexa". Alexa.com. Retrieved October 1, 2018. ^ Steele, Bill (Fall 2012). "Library-managed 'arXiv' spreads scientific advances rapidly and worldwide". Ezra. Ithaca, New York: Cornell University. p. 9. OCLC 263846378. Archived from the original on January 11, 2015. Pronounce it 'archive'. The X represents the Greek letter chi [ χ ]. ^ Ginsparg, Paul (2011). "It was twenty years ago today ...". arXiv:1108.2700 [cs.DL]. ^ "Online Scientific Repository Hits Milestone: With 500,000 Articles, arXiv Established as Vital Library Resource". News.library.cornell.edu. October 3, 2008. Retrieved July 21, 2013. ^ a b c Staff (January 13, 2015). "In the News: Open Access Journals". Drug Discovery & Development. ^ "arXiv monthly submission rate statistics". Arxiv.org. Retrieved November 5, 2017. ^ "Image" (GIF). Cs.cornell.edu. Retrieved March 9, 2019. ^ Butler, Declan (July 5, 2001). "Los Alamos Loses Physics Archive as Preprint Pioneer Heads East". Nature. 412 (6842): 3–4. doi:10.1038/35083708. PMID 11452262. ^ "arXiv mirror sites". arXiv. Archived from the original on August 10, 2014. Retrieved September 25, 2014. ^ Glanz, James (May 1, 2001). "The World of Science Becomes a Global Village; Archive Opens a New Realm of Research". The New York Times. ^ "CORNELL UNIVERSITY LIBRARY ARXIV FINANCIAL PROJECTIONS FOR 2013-2017" (PDF). Confluence.cornell.edu. March 28, 2012. Retrieved February 26, 2017. ^ "arXiv Member Institutions (2018) - arXiv public wiki - Dashboard". confluence.cornell.edu. Retrieved April 1, 2018. ^ Fischman, Joah (August 10, 2011). "The First Free Research-Sharing Site, arXiv, Turns 20 With an Uncertain Future". Chronicle of Higher Education. Retrieved August 12, 2011. ^ Merali, Zeeya. "ArXiv rejections lead to spat over screening process". Nature News. doi:10.1038/nature.2016.19267. Retrieved March 9, 2019. ^ "Front for the arXiv". Front.math.ucdavis.edu. September 10, 2007. Retrieved July 21, 2013. ^ "TablearXiv". Retrieved September 15, 2015. ^ Andy Stevens ([email protected]). "eprintweb". eprintweb. Retrieved July 21, 2013. ^ "eprintweb". eprintweb. Retrieved December 14, 2015. ^ "arXiv License Information". Arxiv.org. Retrieved July 21, 2013. ^ Jackson, Allyn (2002). "From Preprints to E-prints: The Rise of Electronic Preprint Servers in Mathematics" (PDF). Notices of the American Mathematical Society. 49 (1): 23–32. ^ "Front: (In)frequently asked questions". Front.math.ucdavis.edu. Retrieved July 21, 2013. ^ Merali, Zeeya (January 29, 2016). "ArXiv rejections lead to spat over screening process". Nature. Retrieved December 14, 2017. Halpern, Joseph Y. (2000). "CoRR: A Computing Research Repository". Journal of Computer Documentation. 24 (2): 41–48. arXiv:cs.DL/0005003. doi:10.1145/337271.337274. Warner, Simeon (2001). "Open Archives Initiative Protocol Development and Implementation at arXiv". arXiv:cs/0101027.